The Sprint Booklet Makers have long been regarded as top in the industry featuring easy set-up and adjustment, variable speed, and powered exit conveyors. 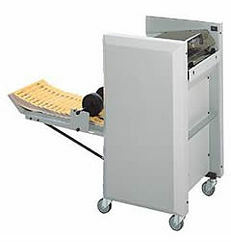 The Sprint 3000 Booklet Maker produces a wide variety of booklets quickly and easily. This machine jogs, staples, and folds in one operation, while one booklet is folding the next is being stapled making it a very efficient production. The Sprint 3000 adjusts from one booklet size to another with ease and is capable of variable speeds and producing booklets up to 100 pages thick. The Sprint 3000 has a built-in powered conveyor which stacks the booklets neatly and folds away to save space. With heavy-duty staple clinchers the Sprint 3000 produces an accurate “flat finish” staple, providing crisp, professional-looking booklets. This machine staples and folds booklets with four different staple head positions which allows for a variety of booklet sizes. The Sprint 3000 can also function as a hand feed system or interface with the MBM FC10 collators. The heavy-duty casters are great for easy mobility and with the transparent safety access covers will not allow machines to operate when open for ideal safety. The Sprint 3000 Booklet Maker has incredible speed that is capable of producing 1,500 booklets per hour making it perfect for copy and print shops, churches, clubs and non-profit organizations. If you have any questions or are interested in the Sprint 3000 Booklet Maker, visit us at SpiralBinding.com. We have great pricing on a full line of Booklet Maker Systems. Call us at 1-800-631-3572 for more information!